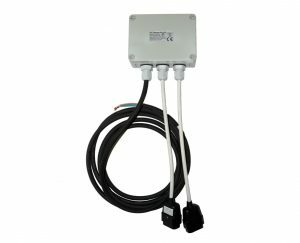 This tank level controller controls the water supply through a high flow solenoid valve to maintain the level of water in a tank. Optional pump isolation versions for both direct pressurised, and indirect (header tank) systems. All TCS5JB Controllers are designed to work in conjunction with an automatic pump. The new low voltage options, TCS5JBL and TCS5JBLA, are suitable for irrigation applications. Control of mains water through a high flow solenoid valve. Type A-A air gap meets UK and EU water regulations, with a unique integrated tundish overflow (air gap supplied with 1/2″ versions only). Float switch lengths of 2m, 15m and 20m, or bespoke to order. Low voltage 24v options available. All components are designed for wall mounting. Available with optional pump isolation for dry run protection, in the event water demand is likely to exceed mains water top-up rate. Designed for use with automatic pumps. Supplied with electrical connectors for ease of installation. 2 metre version can be used for header tank systems. Ingress protection IP65 (main unit), IP54 or IP67 (solenoid).